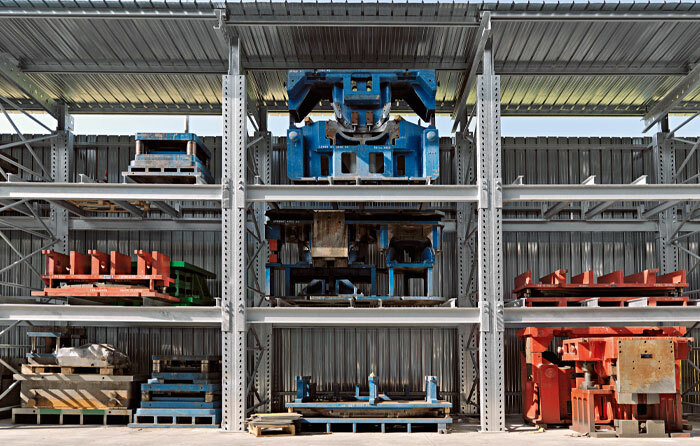 Ideal to meet very high capacity performance such as storage of steel sheets, molds and coils. 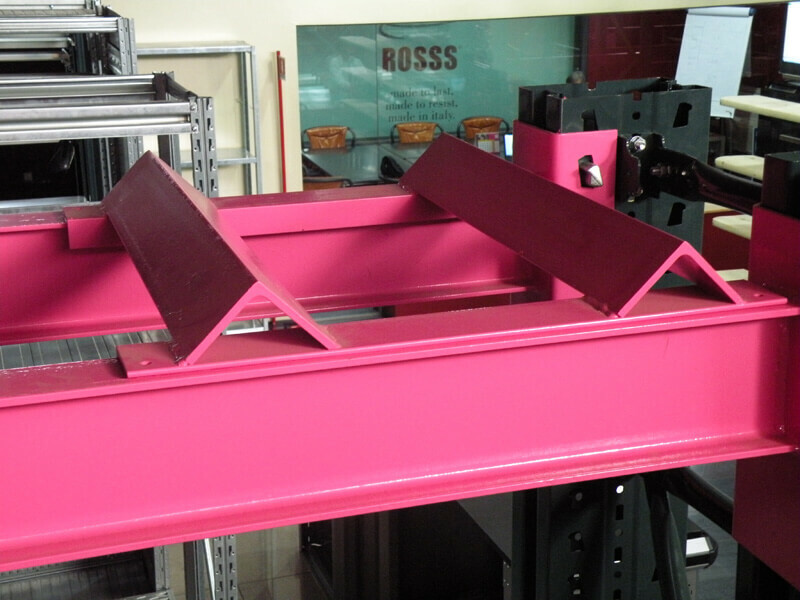 This also thanks to the special camber, covered by exclusive ROSSS patent, which ensures greater stability of the structure. 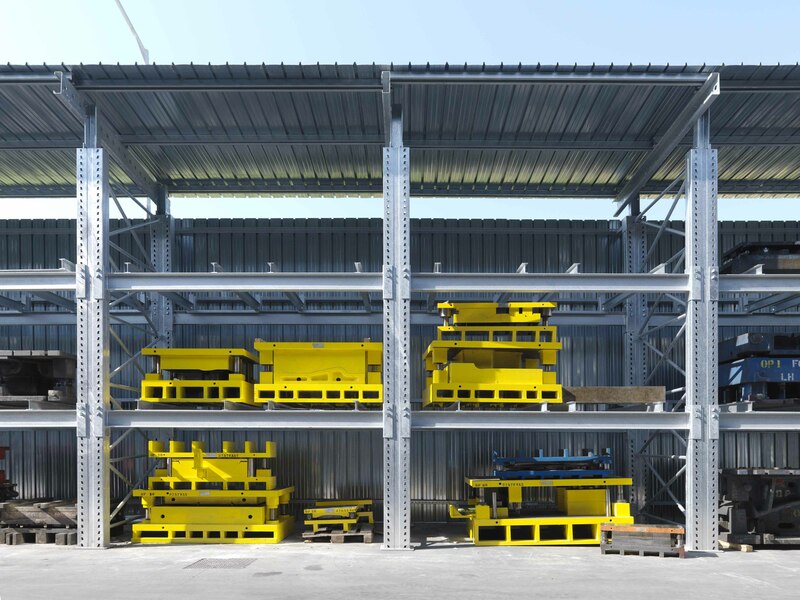 The Mammuth Super pallet rack by ROSSS is a system made up of individual elements that can be assembled to achieve an appropriate structure and which can be equally usefully reconfigured according to the new and different logistical requirements of your warehouse. 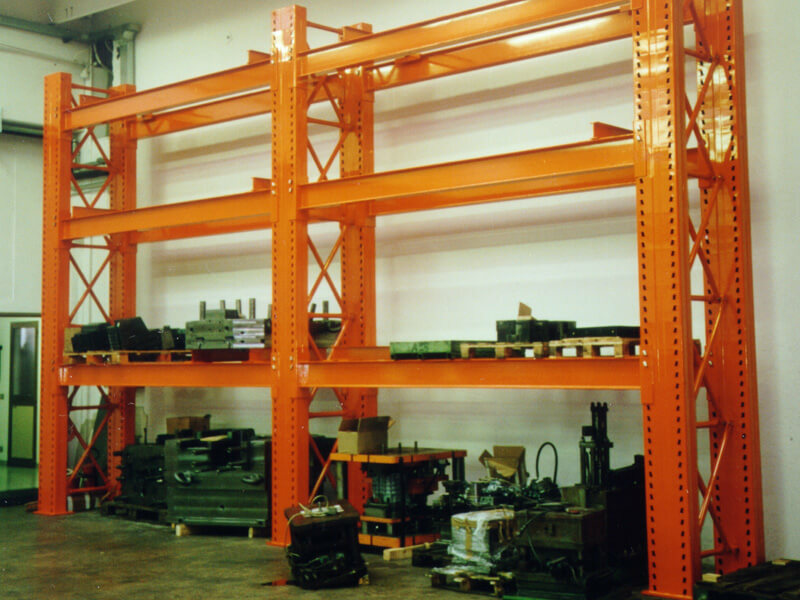 Ideal for the storage of heavy goods such as: bulky products, coils, rolled steel and molds. 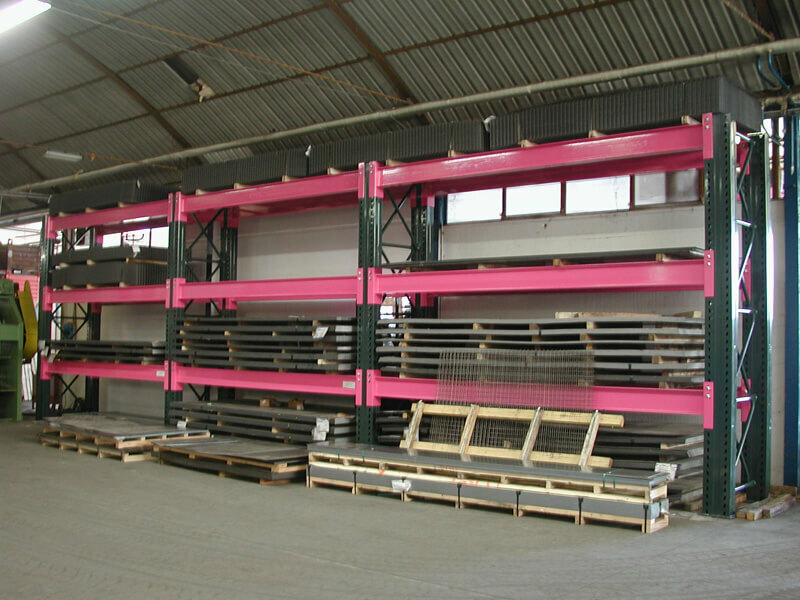 Discover all available applications: Super pallet rack for outdoor molds, rolled steel, for indoor molds, coils. The diagonals are of greater diameter: the columns and all the other elements of the system are held together by special cross vaults, which therefore play a major role in the stability of the entire structure. For this the cross bracings that constitute the diagonals of MAMMUTH ROSSS have a diameter of 42 mm against 30 mm which is normally in use. A slip-proof arm lock. The arm lock (or fixing plug) of conventional plants does not have elements that prevent the slipping in case of stress. The MAMMUTH ROSSS arm lock is made with a production system which is covered by the exclusive ROSSS patent, by molding rather than by extrusion. This allows to model its shape, achieving new and higher performances: the groove created in the contact zone with the structure allows greater stability. A more efficient arm lock. 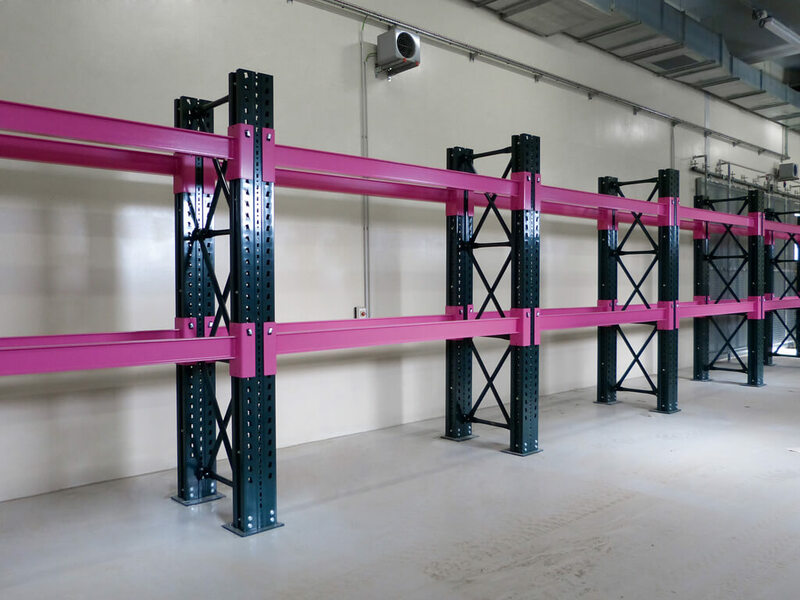 The arm lock is the element on which you unload the remarkable forces, determined by the loads placed on the shelves of the system: it has therefore a crucial task in terms of safety. The MAMMUTH arm locks has an innovative profile, designed to obtain a force discharge on the wider surface of the knuckle bore and especially to direct the same forces laterally on this surface. 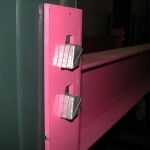 A structural steel camber. 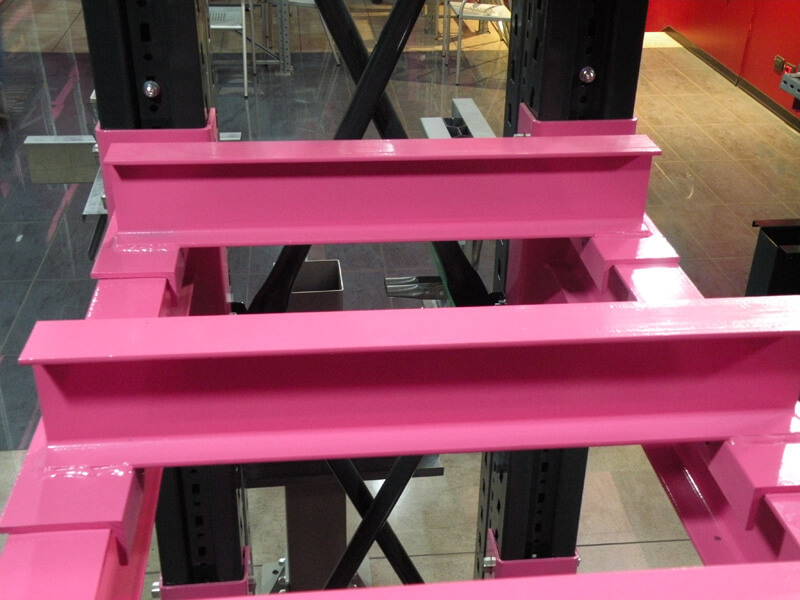 The material with which the camber is made by molding is high quality steel S375 (FE510), certified for structural use. 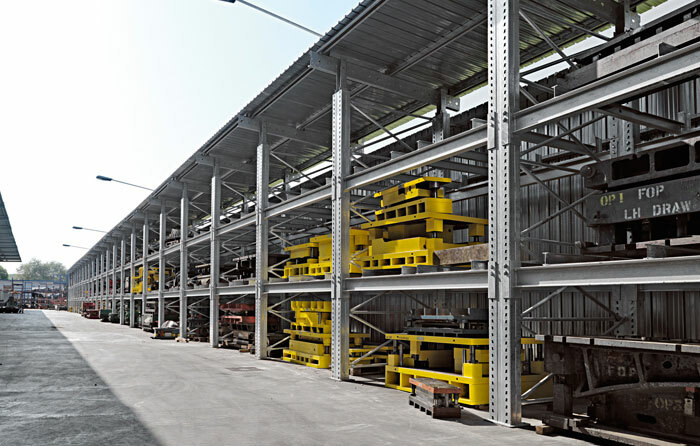 Double secure camber over nine tonnes capacity per floor. 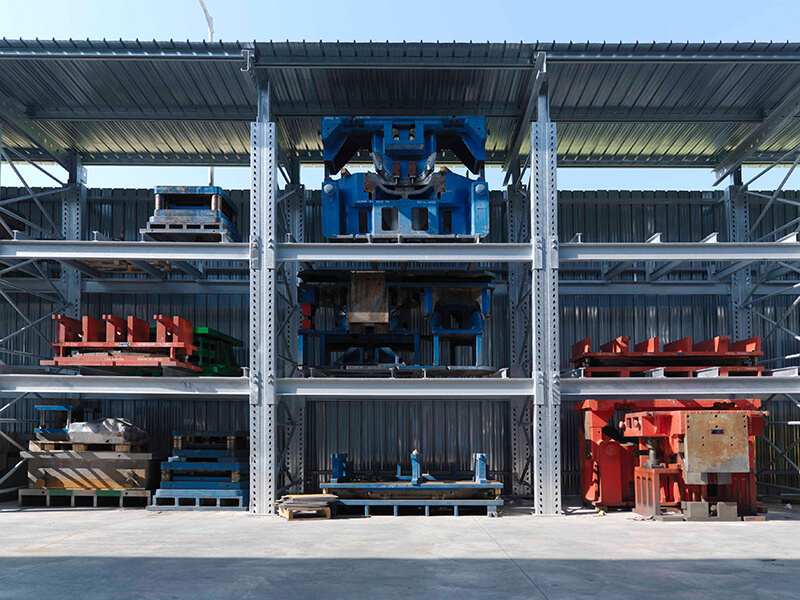 Along with the exceptional performance of the special girders that make up the beams of the system, it is the double fixing camber one of the secrets that enable MAMMUTH ROSSS to reach the incredible capacity of 18 tons per floor. 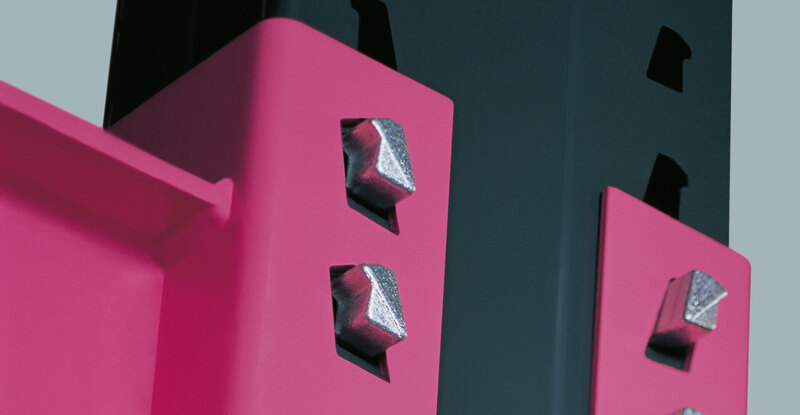 A new product category of extraordinary versatility, a standardized system and not an isolated solution: the extraordinary becomes the system. This is one of the greatest achievements of MAMMUTH ROSSS: facing exceptional tasks with system solutions and not with rigid solutions. 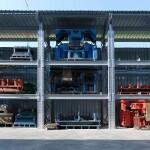 A welded system was created to remain unchanged in its starting configuration, which could not be modified if not without desmantling it and rebuilding it again. 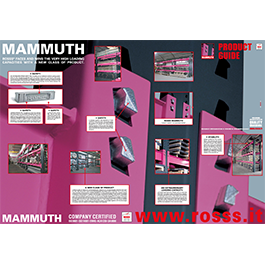 For this MAMMUTH ROSSS was created: in order to have all the advantages of a custom made system and the advantages of a new category of standardized product. 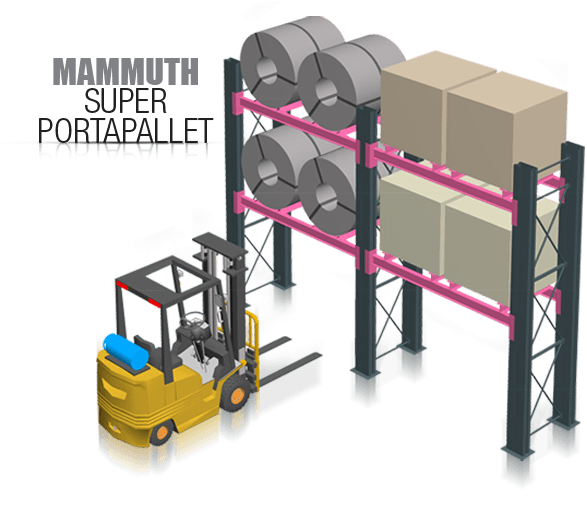 All the accessories for the Mammuth super pallet rack. 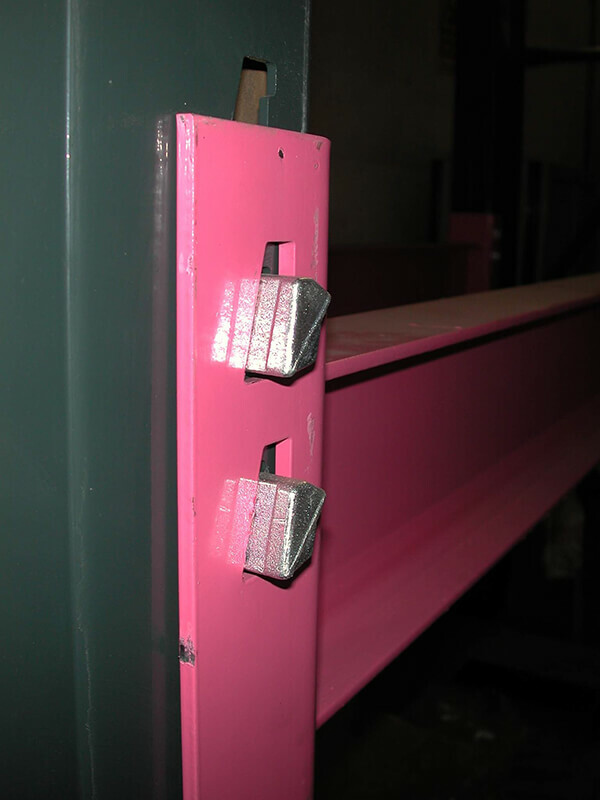 The steel used for the realization of the arm locks is 3.1 certificate structural type.B, S 355JR, with minimum unit yield stress of 355 N / mm2. 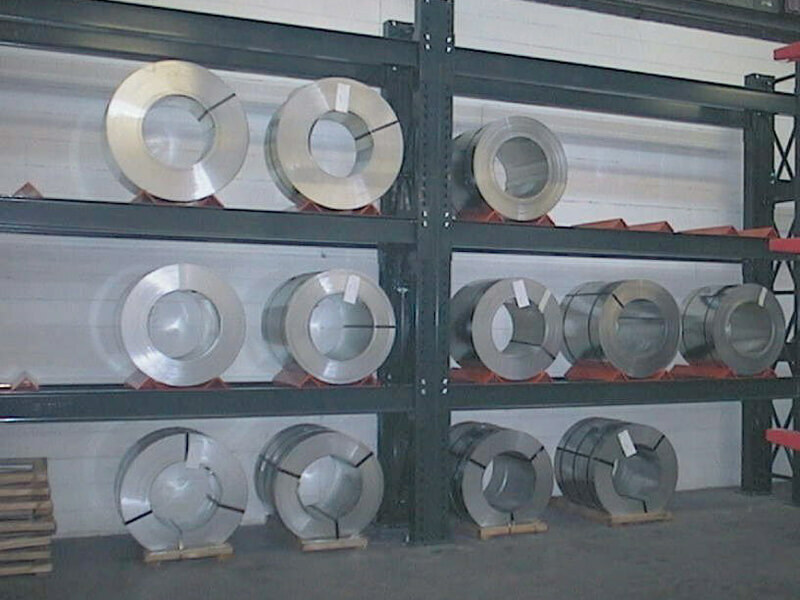 The product is obtained from pickled coils, by molding and galvanizing. 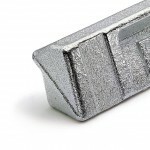 The steel used for the realization of connectors is 3.1 certificate structural type.B, S235JR, with minimum unit yield stress of 235 N / mm2. The product is made from the mold, by means of folding.